On Mar 29, 2015, the "Prins Richard“ caused an oil spill in Rødbyhavn. During the night repair works had been carried out aboard. In the morning hours it was remarked that 0,1 tons hydraulik fuel had leaked out. The ferry port of Rødby was completely closed for 6-7 hours, while the environmental service of the Lolland municipality started the recovery. 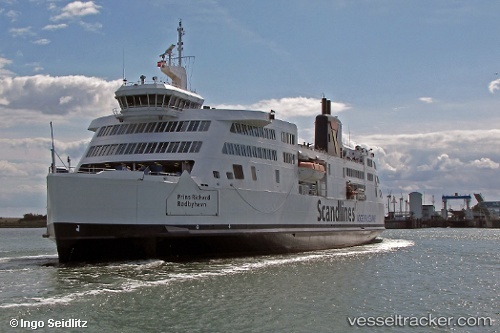 On Dec 25, 2014, the DGzRS coordinated a large scaled SAR operation after a German passenger of the "Prins Richard" had gone over board north of the island Fehmarn. The lifeboats "Bremen" of the station Fehmarn/Großenbrode, "Heiligenhafen" from Heiligenhafen, the Danish "L. W. Dam" of the station Gedser, two ships of the Danish navy, the police boat "Neustrelitz" and two Danish helicopters were involved under the on scene command of the "Bremen. The "Prins Richard" had been underway from Puttgarden to Rødby. The water temperature was 6-8 degrees C. After 3,5 hours the search launched an investigation.